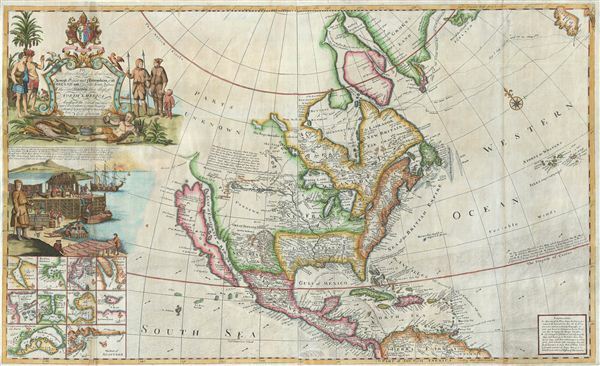 The only known example of Grierson's 1732 piracy of Herman Moll's Codfish Map of North America. To His Grace Hugh, Lord Archbishop of Armagh, Primate and Metropolitan of all Ireland and One of the Lords Justices of the said Kingdom this map of North America According to the Newest and most Exact Observations is most humbly Dedicated by your Graces most humble Serv: Geo: Grierson. An antique map discovery of the utmost rarity. Ostensibly, this is a fine example of Hermann MollÂ's important and highly desirable 1720 Codfish Map, entitled 'To the Right Honourable John Lord Sommers...' Upon closer inspection however, an entirely different picture emerges Â– this is in fact the Irish map publisher George GriersonÂ's 1732 piracy of MollÂ's Codfish Map, entitled, 'To his Grace Hugh Lord ArchbishopÂ….' Although clearly copied from MollÂ's map, GriersonÂ's map is actually a completely new engraving, with original cartouche work, an Irish-centric dedication, and a host of lesser variations throughout. GriersonÂ's piracies of MollÂ's maps are far rarer and more desirable than MollÂ's own work, the present example being the only known Grierson Codfish Map to have ever been on the market and possibly the only one extant. two editions of [Moll's Large Atlas] The World Described... were done by the Dublin publisher George Grierson... all of the maps in the Irish editions were completely re-engraved, even to the point of understandably having been rededicated to contemporary Irish notables. The Grierson atlas had new and/or changed cartouches, dedications, details, and comments. It also showed obvious erasers and additions, and some of the maps were updated. MollÂ's map, 'To the Right Honourable John Lord Sommers...,' was originally published in 1718 or 1720 (there is some dispute on the matter) in counterclaim to Guillaume de LÂ'IsleÂ's most influential map, the 1718 'Carte de La Louisiane de du Cours du Mississipi.' Moll and many other Englishmen were infuriated by De LÂ'IsleÂ's cartographic advocacy for French hegemony in the region, including a vast Louisiana looming over the English coastal colonies and the ceding of Carolina to France. MollÂ's response was this, a much larger and more inclusive map that, though drawing much of its basic cartography from De LÂ'IsleÂ's definitive map, advocates for the British colonies particularly in Carolina. This map gets is common name, the 'Codfish Map,' from the illustration, at left center, of the Newfoundland cod fishery. Dried cod was possibly the most important North American export of the 18th century, and was a mainstay of the British Royal Navy. The British also operated the largest cod fishing fleet in the Grand Banks. Moll illustrates all stages of the fishery, from the catching, to the drying, to the cleaning and packing, to the clothing of a typical fisherman. The intriguing and speculative explorations of the Baron Louis Armand de Lahonton appear in the northwestern quadrant of North America. Lahonton (1666-1715) was a French military officer commanding the fort of St. Joseph, near modern day Port Huron, Michigan. Abandoning his post to live and travel with local Chippewa tribes, Lahonton claims to have explored much of the Upper Mississippi Valley and even discovered a heretofore unknown river, which he dubbed the Longue River. This river he claims to have followed a good distance from its convergence with the Mississippi. Beyond the point where he himself traveled, Lahonton wrote of further lands along the river described by his guides. These include a great saline lake or sea at the base of a mountain ranger. This range, he reported, could be easily crossed, from which further rivers would lead to the mysterious lands of the Mozeemleck, and presumably the Pacific. LahontonÂ's work has been both dismissed as fancy and defended speculation by various scholars. Could Lahonton have been describing indigenous reports of the Great Salt Lake? What river was he on? Perhaps we will never know. What we do know is that on his return to Europe, Lahonton published his travels in an enormously popular book. LahontonÂ's book inspired many important cartographers of his day, Moll, De LÂ'Isle, Popple, Sanson, and Chatelain to name just a few, to include on their maps both the Longue River and the saline sea beyond. The concept of an inland river passage to the Pacific fired the imagination of the French and English, who were aggressively searching for just such a route. Unlike the Spanish, with easy access to the Pacific through the narrow isthmus of Mexico and the Port of Acapulco, the French and English had no easy route by which to offer their furs and other commodities to the affluent markets of Asia. A passage such as Lahonton suggested was just what was needed and wishful thinking more than any factual exploration fuelled the inclusion of LahontonÂ's speculations on so many maps. Just to the south of LahontonÂ's Longue River, past 'Parts Unknown,' the kingdom of Great Teguayo (Great Teguaio) is noted. Teguayo was believed to be one of the seven Kingdoms of Gold presumably to be discovered in the unexplored American west. The name Teguayo first appears in the Benevides Memorial, where it is described as a kingdom of great wealth to rival Quivara, another mythical kingdom which curiously does not appear on this map. The idea was later popularized in Europe by the nefarious Spaniard and deposed governor of New Mexico, the Count of Penalosa, who imagining himself a later day Pizzaro, promoted the Teguayo legend to the royalty of Europe. Originally Teguayo was said to lie west of the Mississippi and north of the Gulf of Mexico, but for some reason, Moll situates it far to the west. Much like MollÂ's map of the West Indies, this map can also be understood as a guide to English piracy and privateering in the Americas. Moll, most likely through his acquaintance with the pirates William Dampier and Woodes Rogers, offers a wealth of information on the traffic of silver bearing Spanish treasure fleets en route from the Mexican port of Veracruz, through the islands, to Spanish ports in Europe. Following the dotted line, Moll identifies the Spanish treasure fleet's entrada into the Caribbean via the passage between Granada and Trinidad. The fleet then sailed westwards, skirting the Spanish Main until they reached Cartagena, where they rested and provisioned before heading northwards, rounding western Cuba and stopping in Havana. Using the strong Gulf Stream current - shown here - ships would sail northwards from Havana while being steadily forced to the southeast thus alighting at the deep water port of Veracruz. On the return, laden with silver from the mines of San Luis Potosi, the Spanish fleet took advantage of eastward blowing trade winds, which helped to overcome the strong current on the sail to Havana. From Havana they would travel northwards via the narrow passage between Florida and the Bahamas before cutting eastward and out to sea at St. Augustine. It was here, in this crucial passage between the English dominated Bahamas and Spanish Florida, where the most nefarious pirates lay in wait for their prey. In addition to descriptions of the sailing routes and currents, Moll provides insets of six important treasure ports, including Port Royal, Veracruz, Havana, Porto Bella, and Cartagena. As privateer fleets grew in strength and number in the early 18th century full scale assaults on major ports became increasingly common. Moll's choice of these key treasure ports leaves little doubt regarding his intentions and sources. As a whole this is a truly remarkable map, rich with captivating elements, beautifully rendered, unique in its piratical executions, and extraordinary rare. Truly a once in a lifetime opportunity for the right collector. George Grierson (1680 - October 27, 1753) was an Irish printer and publisher active in Dublin during the first part of the 18th century. Grierson began publishing when he married Jane Blow, a daughter of the prominent Irish paper making and publishing family of James Blow. In 1727, he was admitted as a Freeman to the city of Dublin and was appointed to the office of Printer General to His Majesty in Ireland. Operating under the title, 'Kings Printer in Dublin' from 1732 to 1753, Grierson was the only printer in Dublin allowed to print Holy Bibles. Later Grierson's attention turned toward cartography, which he identified as a profitable sideline to Bible work. Most of Grierson's cartographic work involved pirating the work of the prominent English eccentric and map publisher Herman Moll. Grierson's first 'Moll' piracies were published shortly following Moll's death in 1732. Though superficially identical to the maps in Moll's The World Describ'd, Grierson's maps are in fact complete re-engravings, often with new cartouche work bearing unique ‘Irishcentric' dedications and themes. Grierson also issued piracies of The English Pilot and Salmon's Modern History. Although George Grierson can be credited with few original maps, his work established Dublin as a center for cartographic engraving and publication in the 18th century. Today's Grierson's Irish versions of Moll's maps are far rarer than Moll's own work and are highly sought after by collectors. Following his 1753 death George Grierson's son, Boulter Grierson, took over the business, beginning a family printing dynasty that would last well into the 19th century. Grierson's offices were located at the 'Sign of the Two Bibles and King's Arms', Essex Street, Dublin. Grierson, G, The World Described, (Dublin) 1732. Very good. Backed with fine linen. Minor repairs here and there including some toning and wear on the original fold lines, else a clean example. Tooley, R.V., Mapping of America, p. 130. Brown University, JCB Library, Cabinet C730 / 2. Mclaughlin, G., The Mapping of California as an Island: An Illustrated Checklist, 192. Goss, J., The Mapmaker’s Art: A History of Cartography, p. 118. Schwartz, S. and Ehrenberg, R., The Mapping of America, pl. 79. Kurlansky, Cod p. 58-60. Wheat, C. I., Mapping of the Transmississippi West, 1540 – 1861, 105. Wagner, H., The Cartography of the Northwest Coast of America to the Year 1800, 514. Phillips (Atlases) 554-7. Leighy, J., California as an Island: An Illustrated Essay, 145.